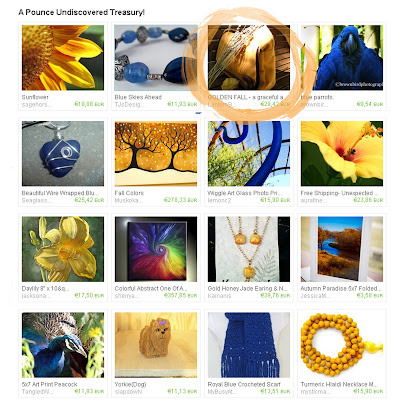 A Pounce Undiscovered Treasury is an Etsy item selection made by Trina in the hope to push some new Etsian on the satysfying route of selling his/her own crafts. Chromatically pleasant and fresh, this list features Lantern Bug's Golden Fall shoulderbag (at the second featuring in an Etsy Treasury list!). Check it out along the other items and help us "Etsy newbies" to get known by the community: spread the word! Many thanks goes to Trina and a huge box of wishes to all the featured Etsians! It was my pleasure to feature your great shoulderbag in my treasury! I wish you much luck and success with your Etsy Shop! Thank you so much for your kind words and for including a link to my Etsy shop in your blog post.